On September 30, 2017, a dream came true in Malibu, California. High, very high on top of the world, Mark and Lorna became united in matrimony. They are from two different continents… When Lorna arrived in the United States from Ireland she had a deep feeling, a yearning in her soul – she knew that her husband was waiting for her her in America. Mark was that man! Yes, a soulmate, it’s true. They met at Melrose Café in West Hollywood, California – it was intense and instant, “just like a magnet”, as Lorna says. From that day forward they never left one another’s side! They fell deeply, madly in LOVE. Great Officiants Lisa Smith had the honor and pleasure of working with these beautiful souls. She composed and delivered the perfect heartfelt Light Catholic Ceremony, combined with our Unity Candle Ceremony.. Lorna’s Mum brought special candles from Ireland for this part. The Irish musicians were performing beautiful soft Celtic music in the background – it sounded like angels were present, peaceful and serene. Love was truly in the air. All of Lorna’s family traveled from Ireland to celebrate – even the family’s dog got to come! Mark’s mom and family, aunties, and cousins came from Texas. Unfortunately, Mark’s Mother broke her ankle. But that didn’t slow her down. Luckily Lorna is a Registered Nurse and knew exactly what to do to take care of her new Mother in Law (this was the first time they met!) The good news is, she will be ok. She was so excited for her only Son that she said she felt no pain. The ceremony was concluded with cheerful Irish Celtic music throughout the evening. Everyone dined and celebrated under the stars overlooking the fabulous and beautiful Pacific Ocean. Congratulations to Mr. and Mrs. David – may their dreams continue to come true! Thank You so much for choosing Great Officiants. At the first trumpeting of the pu (conch shell) by A. Mauricio, Miki’s and David’s unsuspecting guests turned to see what produced the sound and from where the sound came. That initial blast was followed by a second, which gave way to a third longer, extended tone. 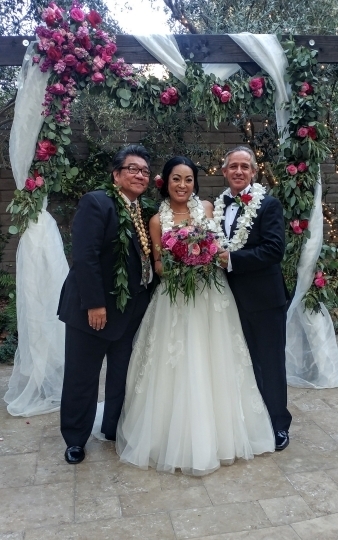 A. Mauricio then further surprised those gathered as he began to recite “Onaona i ka hala me ka lehua…”, the opening line of the Oli Aloha — a traditional Hawaiian welcoming chant — while walking down the aisle. As he took his place before the couple’s family and friends, A. Mauricio concluded the chant with “Aloha ē. Aloha ē. Aloha ē” (which has been translated to mean “Love is here. Love is now. Love is.”). Until the sound of the conch shell was heard, the only ones who knew that Miki and David had chosen to celebrate their wedding Hawaiian style, or in what A. Mauricio described as an “Aloha Infused Wedding”, were the bride and groom, and their DJ. As the ceremony began to unfold, there was little doubt left. In addition to the trumpeting of he pu and the welcome chant, ceremonial observations included a lei exchange between the couple, and a ring blessing using elements that are distinctly associated with the Islands — a koa wood bowl containing Pacific Ocean water, and a ti leaf for dipping into and sprinkling the water on the rings. A. Mauricio offered another traditional chant, which begins with the words “Ei-Ah Eha-No…” as the blessing itself. At the conclusion of the ceremony, Miki and David enjoyed their first honi (kiss) as husband and wife. Afterward, many mahalos (thank yous) were showered on A. Mauricio by both the newlyweds and their guests for having provided a Hawaiian style wedding that truly was unique to the Mainland and memorable. Indeed, for a short while, on a day in mid-October, the Spirit of Aloha rested at the Garland Hotel’s Beverly Park in North Hollywood.